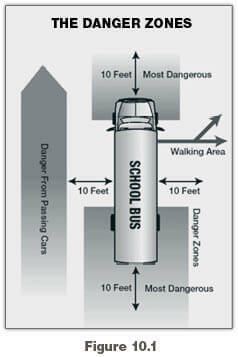 The danger zone is the area on all sides of the bus where children are in the most danger of being hit, either by another vehicle or their own bus. The danger zones may extend as much as 30 feet from the front bumper with the first 10 feet being the most dangerous, 10 feet from the left and right sides of the bus and 10 feet behind the rear bumper of the school bus. In addition, the area to the left of the bus is always considered dangerous because of passing cars. Figure 10.1 illustrates these danger zones. Proper adjustment and use of all mirrors is vital to the safe operation of the school bus in order to observe the danger zone around the bus and look for students, traffic, and other objects in this area. You should always check each mirror before operating the school bus to obtain maximum viewing area. If necessary, have the mirrors adjusted. These mirrors are mounted at the left and right front corners of the bus at the side or front of the windshield. They are used to monitor traffic, check clearances and students on the sides and to the rear of the bus. There is a blind spot immediately below and in front of each mirror and directly in back of the rear bumper. The blind spot behind the bus extends 50 to 150 feet and could extend up to 400 feet depending on the length and width of the bus. 200 feet or 4 bus lengths behind the bus. Figure 10.2 shows how both the outside left and right side flat mirrors should be adjusted. The convex mirrors are located below the outside flat mirrors. They are used to monitor the left and right sides at a wide angle. They provide a view of traffic, clearances, and students at the side of the bus. These mirrors present a view of people and objects that does not accurately reflect their size and distance from the bus. • The entire side of the bus up to the mirror mounts. • Front of the rear tires touching the ground. At least one traffic lane on either side of the bus. Figure 10.3 shows how both the outside left and right side convex mirrors should be adjusted. These mirrors are mounted on both left and right front corners of the bus. 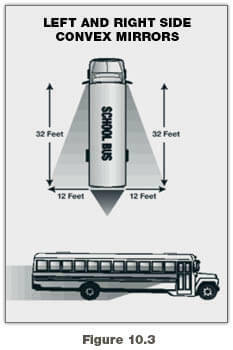 They are used to see the front bumper “danger zone” area directly in front of the bus that is not visible by direct vision, and to view the “danger zone” area to the left side and right side of the bus, including the service door and front wheel area. The mirror presents a view of people and objects that does not accurately reflect their size and distance from the bus. The driver must ensure that these mirrors are properly adjusted. 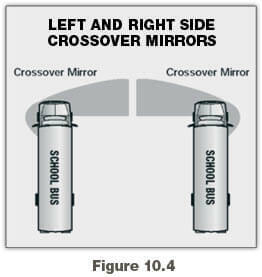 Figure 10.4 illustrates how the left and right side crossover mirrors should be adjusted. This mirror is mounted directly above the windshield on the driver’s side area of the bus. This mirror is used to monitor passenger activity inside the bus. It may provide limited visibility directly in back of the bus if the bus is equipped with a glass-bottomed rear emergency door. There is a blind spot area directly behind the driver’s seat as well as a large blind spot area that begins at the rear bumper and could extend up to 400 feet or more behind the bus. You must use the exterior side mirrors to monitor traffic that approaches and enters this area. The top of the rear window in the top of the mirror. All of the students, including the heads of the students right behind you.